Hawley joined Sens. Tom Cotton (R., Ark.) and David Perdue (R., Ga.) in sponsoring the Reforming American Immigration for a Strong Economy Act (RAISE Act). The bill, first offered in 2017, would aim to increase wages and employment in the United States. It would set immigration rates—prioritizing skilled laborers—at approximately 500,000 people per year, half the current rate. President Donald Trump strongly endorsed the first bill. He characterized it as a "merit-based immigration system that protects our workers, our taxpayers, and our economy." "Switching away from this current system of lower-skilled immigration, and instead adopting a merit-based system, we will have so many more benefits," Trump said. "It will save countless dollars, raise workers’ wages, and help struggling families — including immigrant families — enter the middle class." 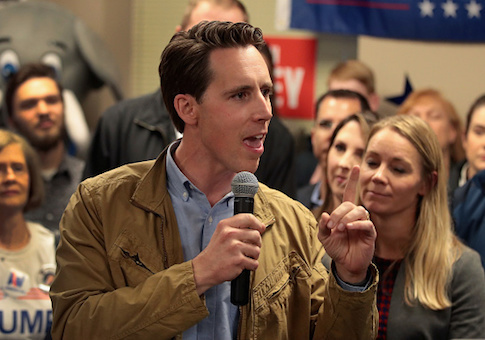 Hawley, who joins the Senate after defeating Claire McCaskill (D., Mo.) in the 2018 midterms, offered his support for the bill. "We need an immigration system that puts American workers first," he said. "Our broken immigration policies hurt hardworking Americans and the talented individuals who are stuck in line, waiting to contribute to our country." According to Politico, the Economic Policy Institute and DHS Immigration Yearbook estimate that current merit-based admissions account for less than a tenth of all lawfully admitted migrants. The bill would focus on reducing the percentage of immigrants dependent on government welfare or competing with Americans for high-demand jobs. It would also end the practice of "chain migration," in which immigrants generate a claim of admissions for family members. Concomitantly, the bill would cap annual refugee admissions at 50,000. The United States is one of the most accommodating countries in the world. From 1980 to 2017, the U.S. resettled more refugees than the rest of the world combined. The reduced number in the RAISE Act would still far outpace the historical average for the rest of the world, let alone any other given country. In a statement, Cotton described the bill as a return to immigration policy aligned with American interests. "For decades, our immigration system has been completely divorced from the needs of our country and has harmed the livelihoods of working-class Americans," he said. Cotton has been the Senate's vocal advocate for severe immigration adjustments, filling a role held by then-Sen. Jeff Sessions (R., Al.) before his nomination for attorney general. "The RAISE Act would build an immigration system that increases working-class wages, creates jobs, and gives every citizen a fair shot at achieving the American Dream, no matter whether their family came over on the Mayflower or just took the Oath of Allegiance." Perdue defended the bill as a necessary measure for economic competitiveness. "If we want to continue to be the global economic leader," Perdue said, "have to welcome the best and brightest from around the world who wish to come to the United States legally to work and make a better life for themselves." The bill's reintroduction follows a week of shifting fortunes for the White House's immigration chiefs. A shakeup at the Department of Homeland Security saw the departure of Secretary Kirstjen Nielsen and several others. She reportedly clashed with Stephen Miller, a senior policy advisor to Trump. Miller, lifelong immigration hawk and skeptic, finds himself a senior hand in an administration navigating a divided congress and record personnel turnover. Miller was closely involved in shaping the bill during its first incarnation. During an August 2017 White House press conference, Miller memorably clashed with reporters with immigration views of their own. In a testy exchange with Glenn Thrush of the New York Times, Miller argued the U.S. had sufficient low-skilled laborers, and no urgent need to bring in more. "If you look at the premise, Glenn, of bringing in low-skilled labor, it's based on the idea that there's a labor shortage for lower-skilled job," he said. "There isn't." The national unemployment rate is currently hovering around 3.8 percent. For those without a high school diploma, that rate is at 5.9 percent, according to the Bureau of Labor Statistics. The bill already has Senate Majority Leader Mitch McConnell's (R., Ky.) support. Read the full text here. This entry was posted in Politics and tagged David Perdue, Immigration, Josh Hawley, Stephen Miller, Tom Cotton. Bookmark the permalink.